In a people centered organization, HR policies and guidelines are most critical as they form an integral part of the people engagement process. A leave or vacation policy needs a balance of providing the much needed time off work for the employees on the one hand, and on the other, the policy has to ensure continuity of work without compromise on productivity. Most departments and functions have moved to an ERP mode in many organizations and HR has not been left behind in this race from manual to automation. Leave management is an essential but very time consuming HR process. Robust leave policies have been laid out keeping in mind the diverse reasons for time away from work that employees require. While organizational goal is the main objective of any corporate function, employee satisfaction is equally important for the maintenance of a conducive and motivated work environment. At times, though an organization professes an employee friendly workplace, management of leave can cause discontent and distress to employees. In other words, leave calculation, decision on awarding leave, reasons for loss of pay, maternity/paternity leave etc need not only strong policies but also a structured and zero error automated system. Inspirria, a leading provider of NetSuite online leave management system software, offers end-to-end automated solution for the entire leave process. Irrespective of where they are, employees can apply for leave online and even obtain their reporting senior's approval on the system. The employee files, heavy with leave applications and approval documents, are a thing of past. The entire online system is paperless, yet with accurate records in place. The Built for NetSuite certified solution features a cloud-based leave tracking system, which is closely integrated with NetSuite. With this system, managing, recording, recalling leave availed by an employee can be done effectively. The employee can be located anywhere in the world and the approving authority in any other part of the world. The leave applications can be easily routed through a dedicated workflow system, enabling the approving managers to act accordingly on the leave request. Through timely notification, communication is routed and in keeping with the differing time zones. This helps a great deal in providing real time visibility to employee and manager alike on leave availed and available. The Leave Management System not only reduces redundancies to ensure an efficient and quick process, it also helps avoid disagreements or disputes over leave availed or left over leave. The at a glance record of an employee’s leave contains the dates availed, reasons, type of leave, manager’s comments and approval and any other data or information that is required for leave clarification. Furthermore, Leave rules can be configured as per needs. As a system for global companies, it allows for localization of types of leave and the leave policies. 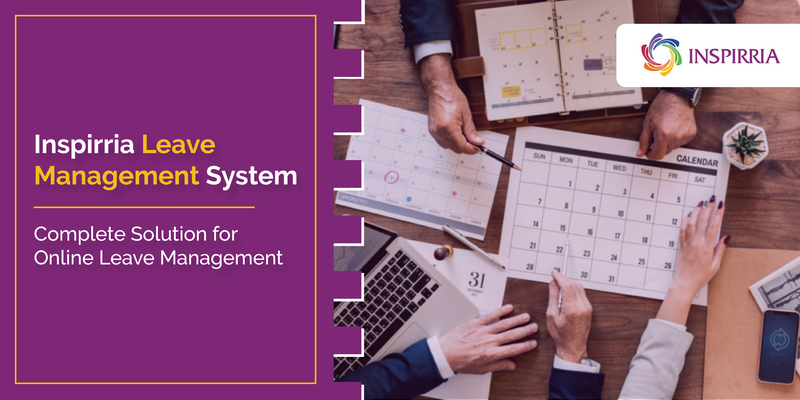 NetSuite’s Online Leave Management System helps in reducing time consuming administrative tasks of the HR function, thus freeing the HR personnel to focus on innovative people engagement activities. Get in touch with Inspirria’s consultants to learn more about the Online Leave Management System.